The Martyrs Pasicratus and Valentine came from the Myzean city of Dorostolum and were soldiers under the governor Absolanus. Pasicratus was 22 years of age, and Valentine – age 30. When a persecution against Christians started, the Martyrs Pasicratus and Valentine openly confessed their faith in Christ. At the trial the Martyr Pasicratus spit at the idol of Apollo, in his refusing to offer sacrifice. The brother of Saint Pasicratus wept and urged him to offer sacrifice to the idols just for the appearance of doing do. But the martyr placed his hand on the sacrifice in the fire and said: "The body is mortal and burns in the fire, the soul however is immortal and contemns all visible torments". 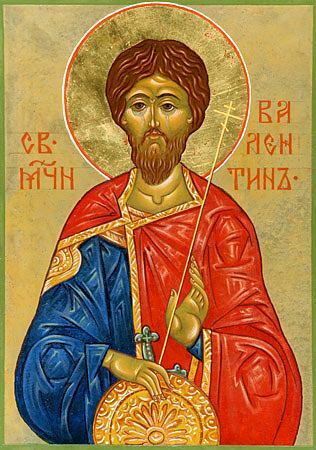 The Martyr Valentine likewise showed his readiness to suffer for Christ. When they led the martyrs to execution, after them also followed the mother of Saint Pasicratus and she exhorted her son not to fear death for Christ. Both martyrs were beheaded by the sword (+ 288).